Nov 30, 2018 ~ A few Sundays ago I woke at 3:30 am. Some of you might be like me and need less sleep as you get older; I seem to do quite well on 6 hours of sleep these days. So, if I go to sleep too early, I will be up way before dawn. I tried to sleep and then gave it up and made coffee. I was skimming the news on my iPad when Bill called at 4:30 am. Bill Maroldo’s biological clock is very different from mine; he usually goes to sleep around 2 am and then sleeps until late morning. There is even a name for it: Delayed Sleep Phase Disorder. Not that he thinks it is a disorder, but you get my drift. But this night he hadn’t been able to sleep at all. We talked for a while and decided… we are up, so why not head out to Anahuac early? We like to go on the weekends since cross-town traffic can be bad during the week. We didn’t make it by dawn but pretty early. My first hawk on a pole was at 6:59 am. We saw plenty of raptors but didn’t have a lot of luck catching any of them. We tried passing them and then getting out of the truck but they were very wary. He was anxious to see if the Crested Caracaras were on the solar tank down Frozen Point Rd. They nested there last year and we had seen several photos on FB showing they were back. Sure enough, there were two adults on the solar structure. At first they were not very close together. And then they were too close together. Just after this above they started mating but I missed all of that. Bill got some photos of the action but her head was blocked by the frame. I think this is the female engaging in a bit of post-amorous preening. I have read that they will reuse old nests so this should be a good spot in the future. We did see a female Northern Harrier waaaaay off in a field close to the bay. She flew and hovered but even with the 1.4x TC and at 700 mm focal length… she is very small in the frame. I was able to keep up with her and the 3-D tracking focus mode followed her pretty well, but … so far away. Dang. I have seen some photos of Harriers on fence posts but I have never been so lucky. Maybe someday. We made our way back to Shoveler’s Pond and found a Turkey Vulture making a meal on what was left of a Poor Little Coot. Bill walked up later and saw the unmistakable coot feet. It was probably killed by a raptor as the skies were full of harriers and hawks. Hope this isn’t too offensive to you. I agree it is kind of gross but it happens all the time. Still wondering why I have 107 images of the vulture and his meal. Northern Harriers forage on the wing, coursing low over the ground. Unlike other hawks, they rely heavily on their sense of hearing to capture prey…. Harriers wintering in the southern part of their range eat cotton rats, house mice, harvest mice, rice rats, shrews, and songbirds. If their hearing is that keen it explains why you can’t sneak up on them. Just before a plunging dive..
A trip down Boat Ramp Rd found some Neoptropic Cormorants near the locks. They are tuning up for Spring; look at the white feathers around his mouth and bright eye. I cannot remember why I had removed the teleconverter. Maybe for the other cormorants that were lined up on the lock. If I had thought about my settings for the image above I would have slowed the shutter speed and upped the ISO BUT it turned out quite well in spite of using whatever I had set for another situation. Maybe he swam into a bright spot, but it is quite nice and I did not do very much post-processing. We saw a Great Egret walking down the ditch across from the lock. 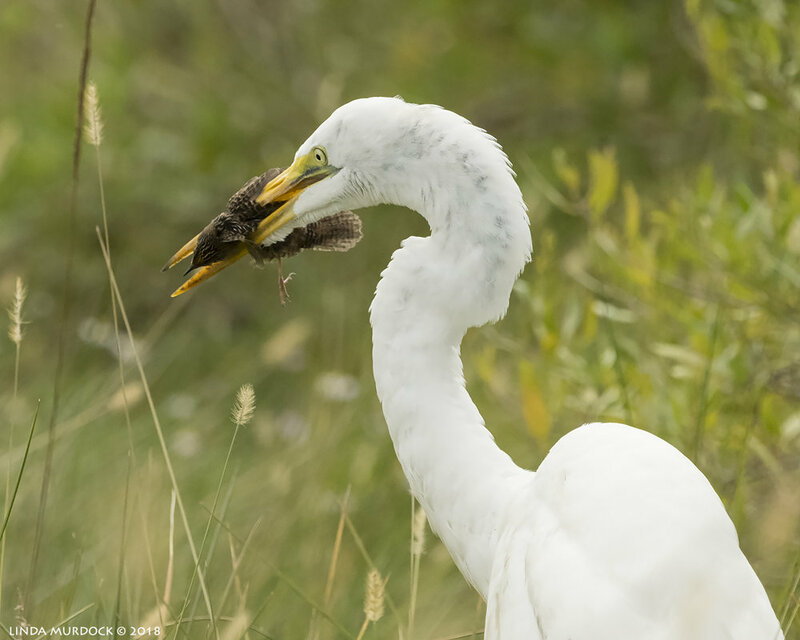 I confess I don’t bother much with Great Egrets out of breeding season. High Island has really spoiled me with all the green lores and fancy plumage. The rest of the year they are kind of plain. So we weren’t focused on him until he grabbed something in the reeds. Of course the first thought was “how did a fish get over there?” There was hardly any water in the ditch... except it wasn’t a fish at all. It might be a Marsh Wren. It is not a rail and the beak looks a bit thin for a sparrow. But it underscores how opportunistic some birds are. We had a lot of fun following the Harriers. It was great practice to jump out of the truck and try to hand-hold follow the swooping birds. And hey… they could have come closer. Bill got some fancy action of two females (or juveniles) doing a bit of acrobatics but I missed the whole thing. Why I was even trying without the teleconverter is a mystery to me. But there were things around besides harriers. Love the reflection on this sunning American Alligator. I thought at first he was resting his head on that bit of bamboo but now I can see it was just behind him. The refuge is very birdy. The ducks and coots are all over Shoveler Pond. Looking up the EXIF data on this one I am puzzled by the f/8. I had been doing a panorama of a different sunning alligator just off the road before this BIF shot. So.. the shutter speed is really too slow, the ISO too high and I didn’t need that much DOF. Still, it looks nice. Maybe I was just distracted that day or perhaps it is difficult to take a bad image with the Nikon D850. It was a long day. We did not walk the boardwalks behind the Nature Center because of the mosquitoes, but I hear there are a lot of smaller birds back there. I think we circled Shoveler’s pond three times that day. An American Bittern eluded us with only some flying away shots. Many more too small-in-the-frame Harrier shots. A lot of noisy Snow Geese flying over. A disappointing encounter with a male Northern Harrier that wouldn’t come close enough. Late afternoon we started home. Lots of hawks on poles on the way out. It is fun trying to figure out if it is a vulture or hawk at first sighting and then see how close you can get before they bolt. 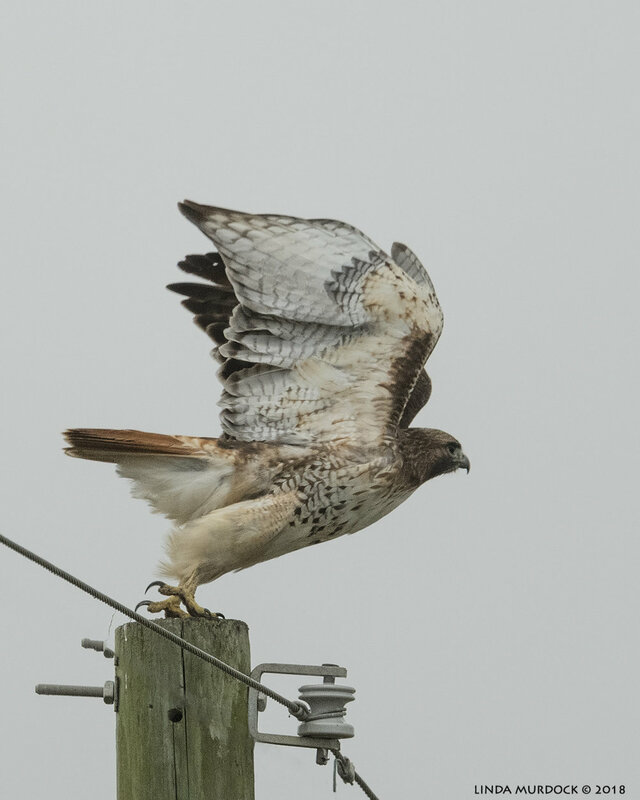 This nice Red-tailed Hawk hop-scotched down several poles trying to avoid us. And we found a Merlin. He wasn’t quite as skittish as the hawk so we did get a few nicer shots. I am much more comfortable hand-holding the 500 f/4 now that I have been using it so much. I still like to prop it on something if possible, but for most BIF shots you are just going to have to have the mobility. After turning off the park road we kept seeing hawks on the utility poles. Then there was a really dark one in a mostly bare tree. It was on my side and we pulled off to get a few shots. I think I had the lens braced on the door while he was in perched in the tree. Bill had walked down the road a bit. It looked almost silhouetted in the late afternoon light. I remember it was hard to tell if he was facing us or if we were seeing his back. He was that dark. … and then he flew up to land like an angel. It is a juvenile Red-tailed Hawk; I had that verified on a Raptor ID site on Facebook. We went on to Ft Anahuac Park but it was really too dark by then. It is a great place to bird and we need to try it earlier in the day. Have you ever been there? Are you checking out all the action at Anahuac Refuge? And… are you an early riser or more like Bill? Let me know in the comments below.